For the second straight year, Ricky Stenhouse, Jr. was the champion of the Nationwide Series as he became the fifth repeat champion in series history this past season. However, we will not see the first ever threepeat as the Mississippian was promoted by team owner Jack Roush to the Sprint Cup Series to replace Matt Kenseth. So in what looks to be a wide open year in the series, who will be the champion? 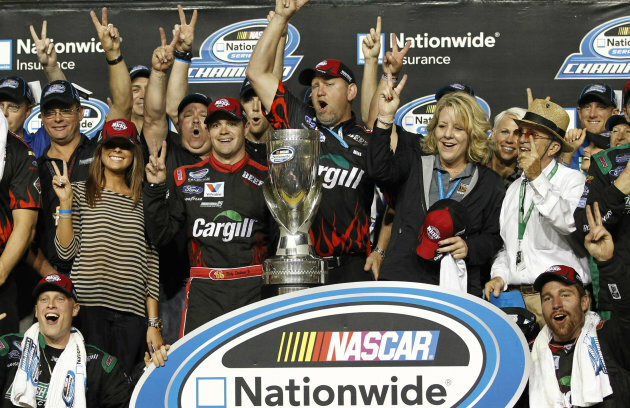 It's time for my 2013 Nationwide Series preview. I really struggled with going between Sadler and Dillon for the series championship because I could easily see both winning it. I think the edge goes to Sadler because he came so close a year ago with leading the points with two races to go and he will benefit greatly from moving to Gibbs, who may field the fastest cars in the Nationwide Series. His vast experience at all levels helps greatly as well. As I said, it was tough to pick between Sadler and Dillon for the title but nobody will be surprised if Dillon wins it all in November. After all, he was remarkably consistent his rookie season in the series with no DNF's, only finishing off the lead lap once, 27 top tens, 16 top fives and a pair of wins. Dillon is truly a rising star and could he do what he did in trucks and win it all his second season? Bayne admitted he was disappointed when it was announced that Ricky Stenhouse, Jr. would take over for Matt Kenseth in the Cup Series but fortunately for him, he at least a full-time Nationwide ride, which he did not have last year. We all know about Bayne's talent, he did win the Daytona 500, don't forget, and if the funding is there, he should be in the mix for the championship. Maybe it's just me but I can't believe that Vickers has not turned 30 yet (turns 30 in October). As we saw last year in his limited run with Michael Waltrip Racing, he still is a very talented racer (three top fives, five top tens in eight races). And now that he has returned full-time to Nationwide, as well as running for an elite team like JGR, he is an immediate title contender in my opinion. It is a shame what happened with Smith and Furniture Row Racing after what he did for that team, especially getting them their first win a year ago, but that's the nature of the business. I think we all saw what Smith and this team is capable of when in their first race together, they went out and won the season finale at Homestead. Hornish has done a great job to resurrect his NASCAR career the past two years in the Nationwide Series after being very inconsistent in his first few years in Cup. With the strong backing of Penske, Hornish was very consistent with no DNF's last year and ten top fives. The team is moving to Ford and that should help Hornish continue to run great. Allgaier has really built himself a solid home in Nationwide over the past four years and he was great once again last year in his Chevy with 19 top tens, six top fives and a win at Montreal. As the lead racer for Turner Scott Motorsports, he should look to run strong once again. I think Annett was one of the bigger surprises of 2012. Running for a team that was just restarting its Nationwide program, Annett finished fifth in points with six top fives and 17 top tens. I think he will take a little bit of a step back with what I view as a stronger field this year but I do think he will come closer to getting his first win. Scott disappointed a year ago with JGR as he was pretty inconsistent, especially as he got off to a very unlucky start with four DNF's in the first eight races and seven overall. Once he got luck on his side he ran very well with four top tens in his last six and I think we will see more of how he finished than of how he started. The former F1 racer really acquainted himself while running in trucks the past few years and he is building well towards a Cup run in a couple of years by doing it the right way as he continues to adjust to stock cars. Piquet won three times combined in trucks (Michigan and Vegas) and Nationwide (Road America) a year ago and he is one of the favorites for Rookie of the Year.